Healthy re-experience with the non-invasive therapy method against extreme sweating . The mains water Iontophoresis (LWI) is one of the effectives, safest and cheapest method to treat excessive sweating. Because of the especial easy and safe handling it suits perfectly for therapy at home. The consistent use of the latest technologies enables the development and production of certified medical devices for innovative, natural healing processes.. The one-time costs for this professional therapy device are comparatively low. In many cases, the insurances covers the cost of acquisition. 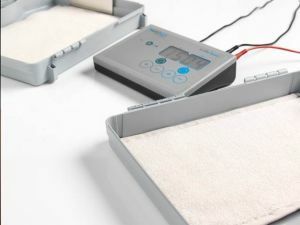 The handling of the iontophoresis device is particularly simple and safe and is therefore suitable as a natural healing method for home therapy. 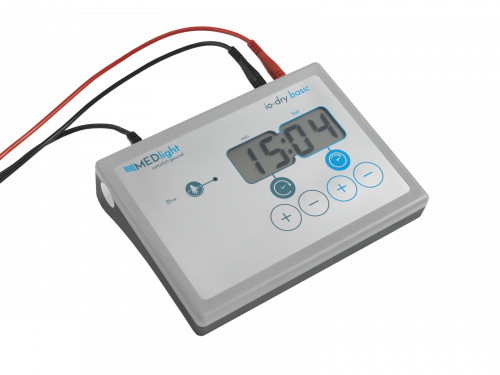 The MEDlight iontophoresis device is characterized by its simple operation and maximum reliability with maximum effectiveness. The io-dry is available in two models. The io-dry basic is equipped with the classic direct current. It has the strongest effect through 100% current delivery with no breaks and is preferably used for the treatment of hyperhidrosis of the feet. The io-dry pulse, on the other hand, is additionally equipped with pulse current and this allows the therapy of both types of current. The pulse current is perceived less strongly, the higher current values can be tolerated. Pulse flow is preferred in the treatment of hands and underarms as well as in the treatment of more sensitive individuals. Tap water iontophoresis requires a source of direct voltage as well as tap water. The tap water serves as an electrically conductive medium between the electrodes and the skin. The treatment takes place in the filled with water case halves, in each of which an electrode is inserted. The included plastic grates avoid direct skin contact with the electrodes. Customer orientation is often underdeveloped in the medical industry. We want to play our part in changing this. Our clients are treated the way they expect to be treated: in an uncomplicated manner and always on equal footing. You can rely on our team to be just a phone call away, ready to respond to your needs. on the skin regions in the treatment water. itself is not affected, but only the nervous “lead”. How effective is the treatment? About 1% of the population suffer from excessive sweating of hands, feet or underarms. 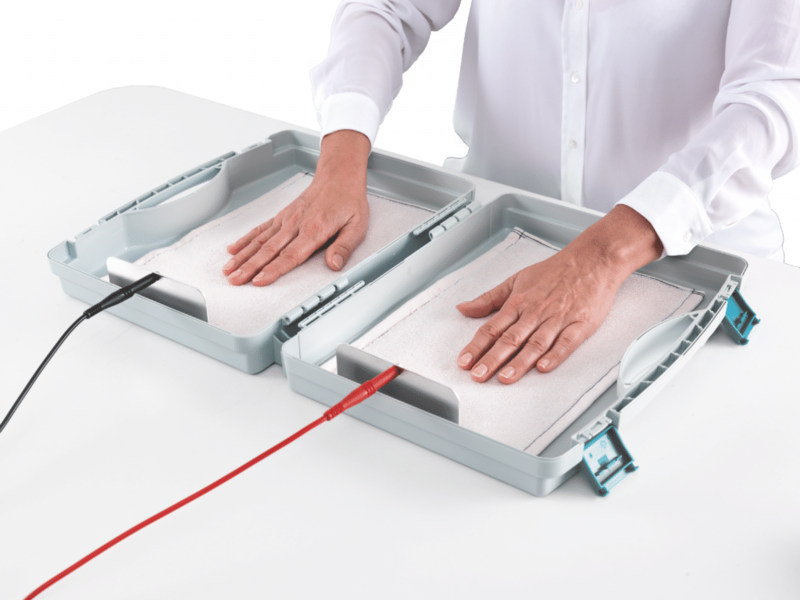 The MEDlight therapy for hyperhidrosis is a treatment method that has been scientifically recognized for many years, providing 98% of the cases with no drugs or surgical interventions for normal dry skin. The MEDlight hyperhidrosis therapy is absolutely harmless and, if correctly carried out, it is virtually free of pain and side effects. for who is it suited for? The use of the io-dry is straightforward and thus suitable for many sufferers. The portable device offers a whole new form of independence – never miss a treatment again. The io-dry provides an effective therapy for hyperhidrosis. Ask your dermatologist if Iontophoresis is right for you and then follow the steps described. Attention: Please note the list of contraindications! phase: In the first phase (initial therapy) will be under medical supervision treated and the implementation of the treatment learned. In the Initial phase should be three times a week and a maximum of once a day be treated for about 15 minutes. After about 10 treatments normalizes the sweat secretion.